So, you want to start a coupon site? It’s definitely a great niche to get into. After all, what’s almost as good as making money? When you start a coupon site, you can help people do just that. And there’s certainly a huge demand for coupon codes, promotions, and other money-saving deals. Consider this, about 59% of adults head online to find promo codes before they make a purchase. In other words, more than half of online shoppers in the U.S. will seek out savings before they buy. That impressive statistic translates to a potentially profitable niche for the savvy saver who wants to start a coupon site to share their money-wise ways with others. Shoppers search for coupons when they’re ready to make a purchase. I don’t know about you, but I often have my virtual cart loaded up and, before I submit my credit card info, will do a quick search to see if I can find a discount. If so, great! If not, no problem. I’m still going to make the purchase. And that’s what makes coupon sites so profitable — people searching for promo codes are primed and ready to buy. When you attract shoppers to your site with coupons and deals before they buy, you’ll find your conversion rates are quite high. Even if you have little traffic, you can still be pretty profitable! But before you start a coupon site, you need to pick a niche. There is no way you’ll be able to compete against the big-name deals sites out there like Groupon, Retail Me Not, Coupon Sherpa, Coupon Chief, Brad’s Deals, etc. And that’s okay. When you nail down a niche, you won’t have to. These big sites focus on all deals across all categories. You, on the other hand, will narrow down a much more targeted (and profitable) audience. A low-competition market is ideal. But it also helps if you have a connection with your chosen niche. Let’s say you’re a baker. You decide to start a coupon site to help shoppers find the best deals on baking supplies. Cupcake toppers, standmixers, cookie sheets, gluten-free flour — if it has to do with baking, you’re going to help people save. Awesome! As a professional baker, you know what brands are popular and you can recommend, with confidence, the best of the best baking supplies. Plus, you can share your professional baking knowledge on your site’s blog, which will help pull in even more traffic. This translates into more sales through your site, which ultimately means more money for you! Experience aside, you still need to find an underserved market and be the one who brings a coupon site to the table. When you do, competition won’t exist and you can focus more on providing quality content to help drive traffic and sales through your site. A quick Google search will determine whether or not a coupon site already exists in your prospective niche. Let’s go back to our baking supplies example. When I search for “baking supply promo code” or “baking supply discount code” or “baking supply coupon,” no niche coupon sites come up! Of course, Retail Me Not and other larger coupon sites appear in the search results. And that’s to be expected. Remember, these mega coupon sites focus on every kind of coupon code and discount under the sun. Grab a pen and paper or open up a new Google Doc and start jotting down potential ideas. Think of your interests, experience, and hobbies. Do any of them fall within the big 3 money-making categories? If so, great! Do a Google search to see if there are any existing coupon sites focusing on that particular niche. Try to come up with ten ideas. I bet at least one of them will turn out to be your niche! So, you’ve got a niche in mind? Great! Now we can take the next step: Setting up your coupon site. If you’ve never owned a website before, I recommend you use BlueHost and WordPress to start a coupon site. Individually, they’re pretty awesome. But when you put them together, you get a super easy way to own and maintain a professional and profitable website. BlueHost is a hosting provider. To get your website seen, you’ll need a host. Think of your host as your coupon site’s landlord. You’ll pay a small amount of ‘rent’ each month to BlueHost to give your site a place to live online. Plus, I’ve put together a no-fail, step-by-step tutorial to help you set up hosting through BlueHost AND install WordPress. Go check it out. I’ll wait here until you’re ready for the next step. In case you wondering why I stronlgy recommend WordPress to start a coupon site, it’s mostly because WordPress is very user-friendly. You can seriously get your site up in a very short time, even if you have zero previous experience. You can also customize your site using themes and plugins, which means you never have to touch a line of code! And there are a number of themes that are made specifically for those who want to start a coupon site (more on that later). With the right theme uploaded, you can have a very pretty and functional coupon site right out of the box. A quick search for coupon theme on marketplaces, like Envato, will yield a ton of results. And, really, you can’t go wrong with any one you choose. But my personal favorite is the Coupon Theme over at My Theme Shop. As soon as you upload and activate this theme on your WordPress site, you’ve got a professional and easy-to-use coupon site, ready to be monetized. And because it’s optimized for conversions, you’ll find it really does make it that much easier to drive sales through your site! Go ahead and demo it before you buy. I know you’re going to love it and its features. If you’ve made it this far, you’re probably wondering how the heck you actually make money off of coupon sites. After all, you’re not actually selling anything. Instead, you’re just giving people money-saving coupons, discount codes and other promos. Where’s the money in that? From Things Remembered to Under Amour, these are all affiliate links! 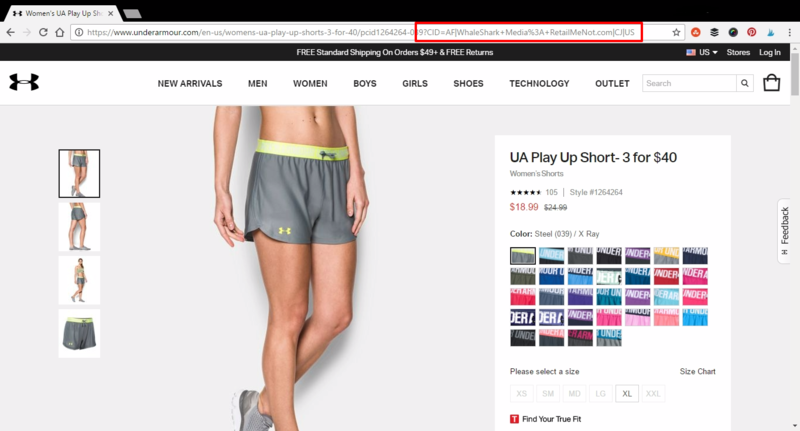 Whenever someone visits the Retail Me Not site, clicks on one of these links, and then makes a purchase, Retail Me Not gets a percentage of the sale. After we cilck on the link from Retail Me Not, the address (highlighted in red above) contains specific tracking info, called a cookie. This is how Under Armour knows that Retail Me Not referred us. Now when we make a purchase, Retail Me Not will get a percentage or commission. Easy, right? That’s it. 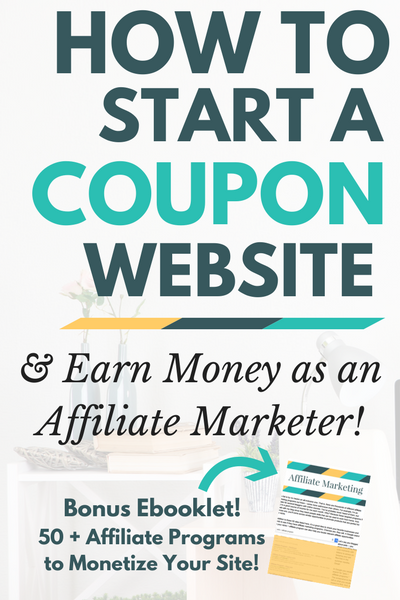 And that’s exactly how you too can start a coupon site and make money as an affiliate marketer! So, how exactly do you find affiliate programs to join? I’m glad you asked! And to help you out, I’ve created this super quick and easy to follow affiliate marketing ebooklet. There are 50 affiliate networks listed as well as helpful hints for finding niche affiliate programs. Ready to start a coupon site? Heck, yes! That’s the spirit. Now make sure you’re going about it the right way. Carefully choose your niche and find relevant affiliate programs you can use to monetize your site. Remember, coupon sites are naturally high converting. Even a little bit of traffic can result in a nice payout every month. But you’ve got to get started! Need some advice? Have a question? I’ve got you covered. Leave them in the comments below! This is awesome Ashlee! My sister in law is thinking of starting a coupon blog. Definitely passing this along! Thanks for putting all this together. Hi Ashlee, I came across this article via @NotNowMomsBusy Facebook page. I just loved this idea of making money from home. One can make really good money with affiliate marketing and here is all how one can begin. Thanks a lot for such an informative article. How do you get the coupons, codes, etc. on the site? Thanks for stopping by! When you sign up for some affiliate programs, you’ll get unique coupon codes that you can use on your site. That way, whenever a visitor clicks through your link and goes on to make a purchase, you’ll earn a commission of the sale. For example, Amazon was running a one-day sale offering $8.62 off a $50+ purchase. You could advertise this promotion on your coupon site using your Amazon Associate ID. Then whenever anyone clicked through to Amazon from your site and bought something, you’d be credited. I hope that makes sense! Let me know if you have anymore questions — I’m always here to help. Those are a great 10 ways to make money online. I myself am a product reviewer and affiliate marketer. Although I have tried different niches, I am focusing more now on the make money online niche. I find this the most interesting. Question: I just started an amazon affiliate account for listing deals . Where do I find Amazons general promo codes so that I can attach my affiliate link to them. Do you know of any companies that custom-build coupon discount affiliate websites? How Retailmenot will know if the user they referred made a purchase or not??? Who will provide me the coupons so that i can list them on my site ? What are the good way of collecting coupons for my coupons site ? Do you know best high commision coupon discount affiliate websites? Thanks. But some networks reject my apply. Super fantabulous article! Thanks for the step by step guide on how to set up a coupon site! Great article and coupon sites are pretty good due to the simple fact that nearly all the traffic are ready to buy or are in buyer mode due to actually seeking coupons. The question is – how do we best get that quality traffic to our sites? Is there any particular traffic source that performs better than others?